Do you searching a best dish to attract your family?. Enjoy Kumbilappam and Neyyappam with a nice hot cup of tea and coffee. No doubt this Kumbilappam and Neyyappam recipes are best opt for you and It is best, when served warm. When you prepare this recipe you forget yourself because of it fragrance. So Please try this dish at your home. Kumbilappam/Steamed Jack fruit dumplings is a traditional and seasonal snack from Kerala 'God's own Country'. It has several names Chakka appam, Vazhanayappam and Chakka Kumbillappam. The flavor of jack fruit and fragrance of the bay leaves together makes a yummy and delicious dish. Kumbilappam generally means 'conical dumpling'. It's a steamed and sweet dumbling and also made as offerings to the God and is presented in the Hindu Temples during the ponkala. Neyyappam is also a variety dish and traditional sweet appam from Kerala. 'Neyyappam' is derived from "Neyy" which means Ghee and "appam", pancake and also made as offerings to the God and is presented in the Hindu 'krishna' Temples. It is very spongy inside and has crispy outer covering. Neyyappam and Unniappam have similar batter, the only difference is in their shapes. Diabetic and cholesterol patients should not consume Neyyappam because it is made up of large quantity of oil. Step 1: Add the jaggery to quarter filled water and boil it for dissolving jaggery and then filter it to remove impurities from jaggery. Step 2: Add rice flour to a bowl and then put jack fruit bulb, cardamom powder, salt, grated coconut, cumin powder and jaggery syrup into the bowl. Then mix well to make a soft paste. 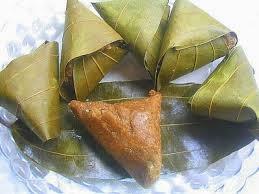 Step 3: Make cone shaped bay leaves and pin it with a coconut stick. Step 4: Fill the batter (consistency of paste should be lesser than chappathi dough) into the cone shaped bay leaves and close it with the remaining part of the bay leaves. Step 5: Cook the dish for 20 minutes. Prick an appam with a toothpick and if the stick comes out clearly without the batter, tasty and delicious food Kumbilappam is ready. You can also replace rice powder with wheat flour so as to become more tasty. 'Varika chakka' is more preferable to 'Koozha chakka'. You can use banana leaves instead of bay leaves. You can use small bananas instead of Jack fruit bulbs with this recipe. Step 2: Add Rice flour to a bowl and then add salt, banana, baking soda and jaggery syrup into the bowl. Mix all the ingredients to a paste form and the consistency should be thick like idly . Step 3: Heat the ghee in pan and add coconut pieces into it. Stir well till it becomes brown color. Step 4: Add these coconut pieces and sesame into the above prepared paste form and mix well. Step 5: Heat oil in a pan. When oil gets heated, pour the batter with help of a ladle. Step 6: Perfect heat of oil can be known by, as you pour the batter Neyappam should not settle down, but should come up. Step 7: Turn the other side of Neyappam. Fry till it becomes golden brown and drain the oil from Neyappam by using a kitchen towel. Keep in low medium flame, so that Neyappam will not get over burnt. You can substitute wheat flour with maida/all purpose flour. You can also substitute jaggery with sugar. If you feel jaggery having any impurities, melt it with little water in stove, and filter it. Then add the wheat flour to it and make batter, adjust water proportion. Can fry more than one at a time, depending upon the amount of oil we keep for frying. Keep little oil more than needed for shallow frying and use a deep curved laddle and pour one at a time. If we omit banana, the softness reduces, but you get the full flavour of wheat flour/rice flour. You can fry in ghee, which will give an excellent taste.